There’s no holding back on extras from Gold Frankincense and Myrrh. Their stunning Darling Dolls collection is bursting with fabulous frills, lace, sequins, eye patches and more! 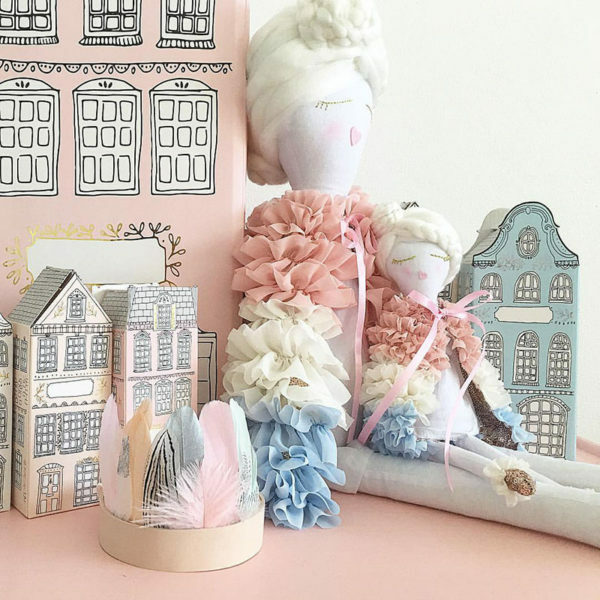 Melbourne’s Gold Frankincense and Myrrh is home to handmade dolls of differing personalities – there’s the refined and classic Lulu, vintage bohemian styled Mimi, showy and theatrical Valentine, while Pirate Bobby appears to be the outdoorsy nautical type. For those who can’t see past the fabulous Valentine Doll in all her multi colour ruffles and rose gold sequin glory, a matching Ruffle Cape ($79.95) is available to fit children. We know, there’s never been a superhero quite this glamorous and we love it! Dolls are available in two sizes, 75 centimetres tall (priced from $176) and a more petite 37 centimetres tall ($49.95), both are perfect for snuggling and playing. Order direct from Gold Frankincense and Myrrh.